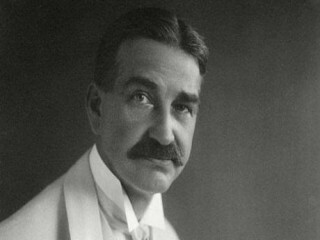 Lyman Frank Baum was an American author of children's books, best known for writing The Wonderful Wizard of Oz. He wrote thirteen novel sequels, nine other fantasy novels, and a host of other works (55 novels in total, plus four "lost" novels), 82 short stories, over 200 poems, an unknown number of scripts, and many miscellaneous writings), and made numerous attempts to bring his works to the stage and screen. His works predicted such century-later commonplaces as television, laptop computers (The Master Key), wireless telephones (Tik-Tok of Oz), women in high risk, action-heavy occupations (Mary Louise in the Country), and the ubiquity of advertising on clothing (Aunt Jane's Nieces at Work). Baum grew up to become a man of great charm and many interests, yet he had little direction. He pursued a variety of careers ranging from acting to newspaper reporting to theatrical management to writing plays. One of his plays, The Maid of Arran, was a surprise smash hit, and Frank and his company toured with it throughout the United States and Canada in the early 1880s. While at home on a break from the tour, Baum met and became engaged to Maud Gage, youngest daughter of prominent women's suffrage activist Matilda J. Gage. The strong-willed Matilda did not approve of the impractical Baum, but Maud, equally determined, insisted, and the two were married in November 1882. The marriage, apparently one of opposites, was a happy one, as Maud provided Baum with the stability and good sense he needed, and eventually for their children the discipline he was too gentle to perform. Baum gave up acting when Maud became pregnant with their first child and all the scenery, props, and costumes for The Maid of Arran were destroyed in a fire. He worked for a time in the family oil business in Syracuse, still writing plays in his spare time, none of which were produced. In the late 1880s he and the family, which now included two sons, moved to the Dakota Territory, where Baum worked for a time as a shopkeeper and then as a newspaper editor, enjoying both jobs but failing financially in each. By 1891 it was clear that his growing family, now with four sons, required that he find a job that would provide financial stability. They moved to Chicago, where he was first a newspaper reporter but soon took a better paying job as a traveling salesman with a crockery firm. At the suggestion of his mother-in-law, Baum began to write down some of the stories he made up to tell his sons every evening when he was home. One of these stories, Mother Goose in Prose, was published in 1897. The book sold well, and, on the advice of his doctor, Baum gave up his traveling job. Instead, he became the editor of a journal for window-dressers, which also did well. Baum next decided to collaborate on a children's book with a friend, the artist W. W. Denslow. Father Goose, His Book, published in 1899, was a best-seller. One of the five books he published in 1900, also based on stories he had told his sons and illustrated by Denslow, was The Wonderful Wizard of Oz, which immediately broke records for sales and made Baum a celebrity. At the suggestion of his publisher, Baum's book, with substantial changes to fit the theatrical tastes of the day, was made into a musical in 1902, which also was a great success and toured the United States for years. A second Oz book, The Marvelous Land of Oz, a clever satire on the women's suffrage movement, was published in 1904 and was very popular, and other Oz books followed, though none matched the originality or sales of the first two books. In addition, over the next two decades he wrote over 35 non-Oz books under various pseudonyms and aimed at various audiences. Most of these were "pot-boilers," but they did well financially and helped make Baum a wealthy man. Always looking for new outlets for his creativity, Baum became interested in films. In 1909 he founded a company to produce hand-colored slides featuring characters from his Oz books. These were shown while he narrated and an orchestra played background music. Although highly innovative, these "radio-plays," as he called them, lost a great deal of money, and in June 1911 he was forced to declare bankruptcy. A later venture into the film business, the Oz Film Company in 1914, produced six movies but experienced severe distribution problems and also failed, though not as disastrously. Using money Maud had inherited from her mother, the Baums moved to Hollywood, California, in 1910 for Frank's health, and there built Ozcot, a large home with an impressive garden. Here he produced additional Oz books, to a total of 14, which helped ease his financial problems. But with most of his fortune gone and his health failing, in his later years Baum lived quietly at Ozcot, gardening, writing stories, and answering the hundreds of letters he received from Oz-struck children. After a protracted illness in his gall-bladder and a 24 hour coma, he died on May 6, 1919, supposedly uttering, "Now we can cross the Shifting Sands" just a minute before expiring. Baum's Oz books were so popular and profitable that after his death, with Maud's permission, the publishers continued the series using other writers. In addition, the lasting popularity of Oz was in no small way aided by film versions of The Wonderful Wizard of Oz, the 1925 silent version with Oliver Hardy as the Tin-Man, and most notably the 1939 classic MGM musical with Judy Garland as Dorothy. Although Baum's avowed intention was merely to entertain children with unique American creations and American values, his Oz books have been endlessly criticized and analyzed, and they sometimes have been banned from libraries as being too imaginative, too frightening, or even too dull. Nonetheless, they constitute 20th century America's first and most enduring contribution to children's fantasy literature.